The day began at Wal-Mart in Canton, Ohio. After only two miles of driving the back left wheel broke and flew off. We had to stop on the side of the road, decide what we were going to do about the problem, and then come up with a plan. After only a few minutes a guy was nice enough to stop and direct Mrs. Turman and Mr. Reese to the nearest Lowes. They rushed there as fast as they could and bought the parts we needed to fix the back end, and we repaired it as fast as we could so that we could get back on the road. We were running pretty good, but shortly before we got to the days finish line we had another small set back. Lance was driving and noticed that a weld had broken that's purpose was to brace the array. Once again we pulled over, and managed to fix the problem within minutes and get back on the road. Even though our day held a few obstacles, our team stuck together and worked through them and managed to win day seven, putting us in the lead of the race. Day six was a pretty smooth day for our team. We drove from Wilmington Court House in Ohio to Lancaster, Ohio. In Lancaster we displayed our cars at a car show they were having! This town was very welcoming and presented us with a gift for us to remember our time there. They were having a small festival and it was so much fun! 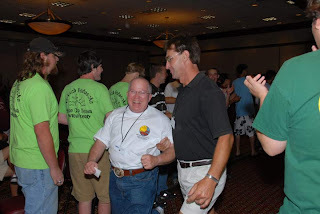 Some of our team was even up with the town members doing a line dance. We then trailered on into Canton, Ohio. Of course we got lost on our way there... I think we have gotten lost during our trailer time almost everyday we have had to trailer!! Though we have made a few wrong turns and taken a few wrong exits our adults are doing a really good job, these roads up here are just confusing compared to Mississippi roads! 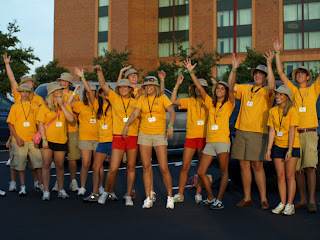 Our team did win day six and we were all very excited!! 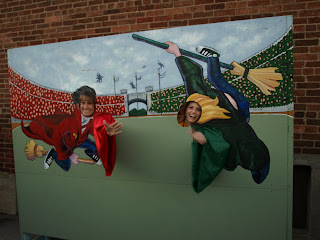 Mrs. Ellison and Susan George at the Harry Potter festival! We have driven so many miles that we ran blew the tire off the open trailer on our way Wilmington, Ohio. Our rest stop where we got to tour the facilities! The Vice President of YUSA gettin ready to drive our car! Friday we left Nashville, Tennessee, trailered to Wilmington, Ohio, and then drove to Washington Court House in Ohio. We only had to drive about 29 miles, but this was a very hard few miles because we were going through towns and trying not to get stuck at red lights. We managed to make it through most of the red lights and only got stuck at about two or three out of some nineteen! 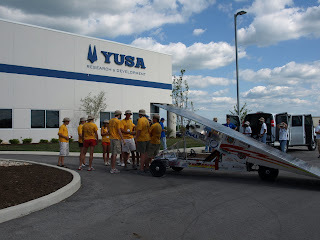 One of our rest stops was YUSA, this company was nice enough to give us a short tour and even provided us with supper later that night. Their Vice President, Vincent Allgeier, even came down to our car and took it for a little spin around the Court House. 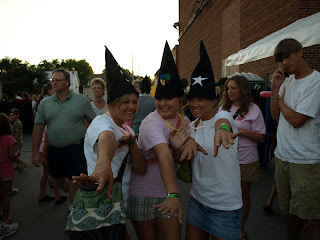 Later in the evening, some of the group went to the Harry Potter festival that was going on in Wilmington, Ohio, and it was so much fun. 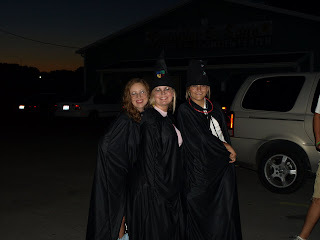 We bought capes, hats, and Harry Potter glasses and made lots of pictures with the people that were dressed up as characters from the book. This morning we found out that we did win yesterday too!!! So day four and five were really good for us! 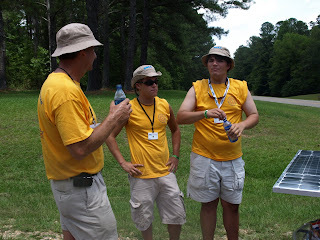 Stopped on the side of the Natchez Trace, Patrick, Lance, and Mr. Reese having a small discussion about what was ahead! 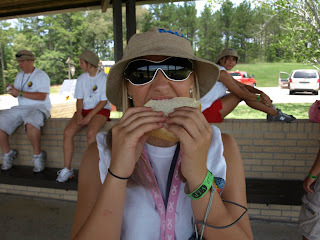 Hilary eating her lunch! She looks hungry doesn't she?? 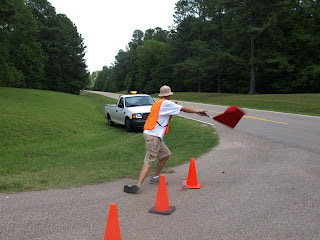 Clay being a great safety officer... he was waving the traffic around and protecting the solar car! 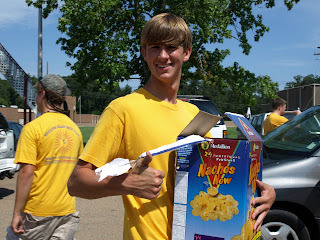 Clay bringing us all the sweet potatoe snacks that we got in Houston! Caleb and Jeri-Laken, taking a load off for a minute! Day four was a hard day for some of the team because after sleeping in our own beds for a night it was hard to not want to stay there. Despite how much we all enjoyed being in Houston, everyone got up and left out at 9:00 AM as we had every other day. We drove up the Natchez Trace all the way to Cherokee, Alabama, and then trailered into Nashville, Tennessee. Our team felt like we had a pretty good day because during the time we were racing we were having to watch our speed so we did not exceed the speed limit on the Trace. That is pretty awesome to have to worry about going over the speed limit instead of going under it and holding up traffic. Once we got into Nashville we displayed our cars at one of the Dell headquarters. They had us a very nice meal and everyone there was extremely nice! Sundancer did win this day, so we were all very excited!! Mr. Reese soaking up the sun! 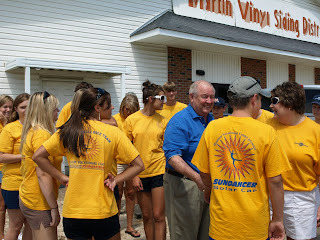 Big thanks to Steven Iames with Waukaway Water Company for donating the "Sundancer" water! It has been a big hit throughout the race. Mrs. Ellison with her grandchildren when we were in Houston! Me and Paige riding the motorcycles with Mr. Todd and Mr. Rob! Everyone loved that they got motorcycle escorts into town. Our team recieving a check for $5,000 from the Mississippi Biomass Council! Thank you so much!! Day three of the race was Wednesday. 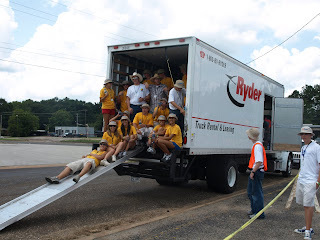 Our team left Shreveport about 6:30 AM, trailered the car to Canton, Mississippi, and then put the car out and drove on into our hometown HOUSTON, MISSISSIPPI! We had a pretty hard day, but we still managed to get on home. 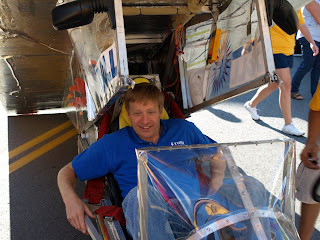 We did not get the average speed that we had hoped for, but it was not anything the team did; the bolt broke on the accelerator causing us to have to slow down quite a bit. We did not win day three, but we were so excited to be home our team did not let that get our heads down! All of our fellow racing teams loved the hospitality shown by Houston. They loved that someone was willing to wash their clothes and had planned so many things for us to do. California was also very grateful because they finally got their car to work because everyone around the town that could chipped in to assist them in anyway possible. We all also loved the great food, goodie bags and baskets, and last but not least the Elvis Impersonator! On behalf of the entire Sundancer team, I would just like to thank everyone in Houston for everything you all did for us and for everyone coming out to see us. It made not only our team feel special, but everyone else's too! We love all of you and are so grateful to have such a supportive town backing us through all of our adventures! We love the water truck boys!! Thanks to Ryder for donating this lovely truck! 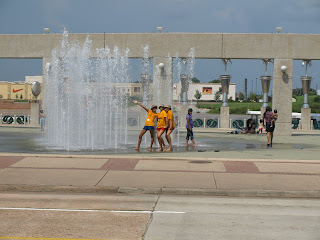 Once we got to Shreveport, Louisiana, we were hot and glad to get some relief by playing in the water! Being presented with the key to Henderson, Texas! We enjoyed this town very much... the people were so nice and made us feel right at home! 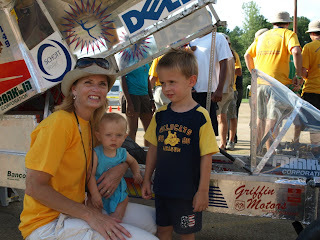 We were letting all the kids from this town sit in our car to see what it feels like to be the driver of a solar car. The second day of the race was Tuesday. Everyone woke up early to go get the car out and get it charged up for the day we had ahead of us. We went out second in the line up, so we actually started racing about 9:02. 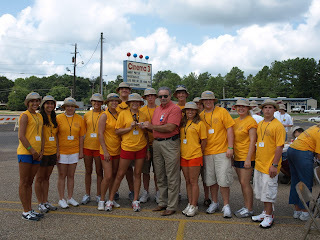 We left Palestine, Texas, drove 117.8 miles, and then trailered the car on into Shreveport, Louisiana. The drivers of the day were Caleb Alford and Lance Whitworth. When we got to Shreveport we displayed our car infront of the local Science Museum. It was a lot of fun because we got to tour the museum for free and it was also a great chance to get out of the sun and get in a cool place! 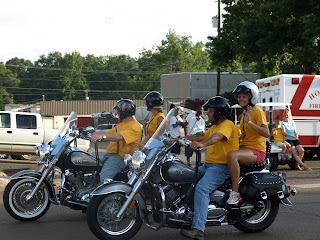 Our team really enjoyed our time in Shreveport, and to make it even better... WE WON THE SECOND DAY OF THE RACE!!! Monday was the first day of the race. We started at the Dell Headquarters in Round Rock, Texas, drove 115.6 miles, and then put our car in the trailer and took it on into Palestine, Texas, to spend the night. The drivers were Caleb Alford, LanceWhitworth, and Me (Leigh Springer). Since I drove, I know from experience... 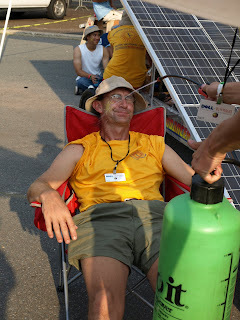 IT WAS EXTREMEMLY HOT IN THAT SOLAR CAR!! We did not win the first day, but we did not finish far behind New York, who won first place for the day. Yesterday, which was Sunday, all the other teams finished up scrutineering and then we all went to Austin and did a big media event. It was so much fun and all the new team members learned a lot about public relations and how to talk to people about our car. Then we came back to the hotel and realized that our blinkers were not working properly, so we had to stay down and work get them fixed. We managed to get everything working properly Sunday night so that the car was ready to race Monday morning. Last night the interns hosted a team mixer, where all the teams went so that we could get to know each other better. Our team had lots of fun and met many new people. We danced, played games, and enjoyed the band! All in all we thoroughly enjoyed ourselves and were very glad we attended. *Above are some pictures of some of our team members as well as a few others and Dr. Marks and Mr. Reese dancing!! Yesterday was scrutineering for all the teams. Scrutineering is where all teams must qualify their cars in order to race. Our team flew through it with flying colors. The day started out rainy, but at about lunch it stopped and we began. We qualified 15 of our team members as drivers and completed all of the other 5 scrutineering stations in record time. Getting the car loaded up to head out to the Dell-Winston Solar Challenge 2007!! Mr. Ricky Allen checking driver's licenses before we left the school to make sure everyone is legal to drive. 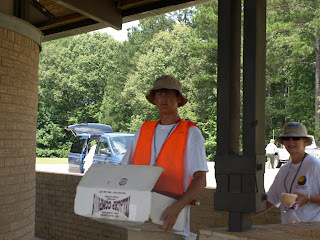 This is Clay getting ready to leave, he's not leaving any of the food behind!! Thanks to Mr. Leon Martin for donating a van for us to use during the next two weeks for the cross-country race. Thanks to Mr. Steve Eaton of Eaton Motors of Houston, Mississippi for also donating us a van. Big Thanks to Mr. Raymond Griffin of Griffin Motors in Houston, Mississippi for all of his hard work and dedication to the Sundancer Team. 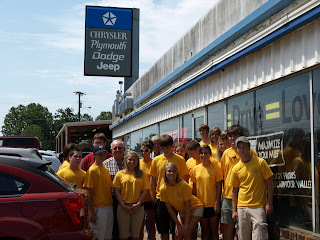 We appreciate Mr. Griffin for always donating the team a van for transportation, helping us get transportation from Chrysler in Australia, and also for his diligent work that resulted in our team being the recipient of a major Chrysler grant. 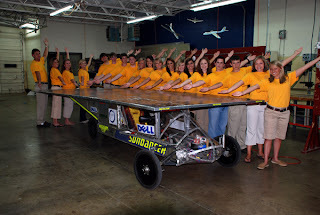 This is the 2007 Houston Solar Race Team. 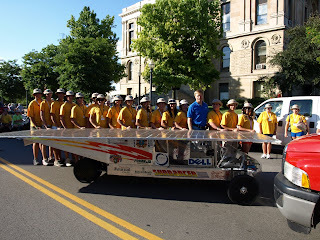 The team as well as everyone else going on the 2007 Dell-Winston Solar Challenge has been hard at work all summer long preparing for the race that faces them. Everyone in the town of Houston is very excited and looking forward to following the Sundancer throughout the nine day race. The team also sends out a huge thank you to Dr. Marks and his staff for putting on this race, Dell Computers for their continued sponsorship, and to our very own local sundancer committee that has planned a special ceremony for when the Dell-Winston Solar Challenge comes to Houston on July 18th for an overnight stay.